Previous post: Sometimes…I add more truffle oil. 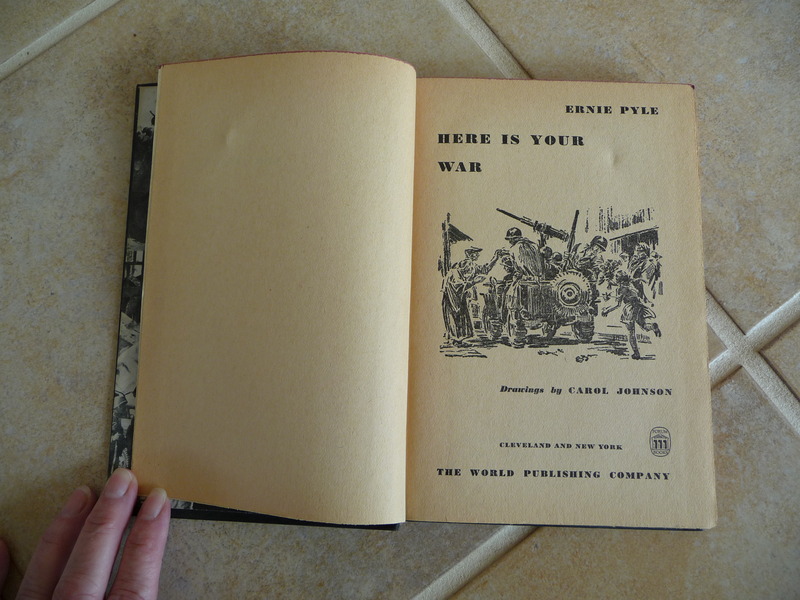 I found this copy of Ernie Pyle’s Here is Your War in — wait for it — the local Salvation Army thrift shop. I opened it to find that the endpapers were a montage of still photographs from The Story of GI Joe, the 1945 film made from the book, with Burgess Meredith playing Pyle and Robert Mitchum playing the character based on Captain Waskow, from Pyle’s most famous story. I paged through and it is wonderfully illustrated by Carol Johnson channeling Bill Mauldin. It was a foregone conclusion that I was going to buy this book, which I did, for the princely sum of fifty cents, and I took it home and started reading it. At page 107 (Chapter 9. Sherman Had a Word for It), this fell out. First, “Rambo” is an actual name? I thought Hollywood made it up. Second, there is a whole story in that little two-and-a-half by four-inch piece of paper. Who was Norman? What was he doing in Nome? Was he stationed there during the war? It had been over for four months, why was he still there? How long had he been there? Did he really only get to Chapter 9? Maybe he finished Chapter 8 and he got his orders to go home and he was in such a rush to pack he left the book behind. I got nothing for how the book got from Nome to Homer. Did Norman head straight on down to the Board of Trade the evening of December 18th, 1945? 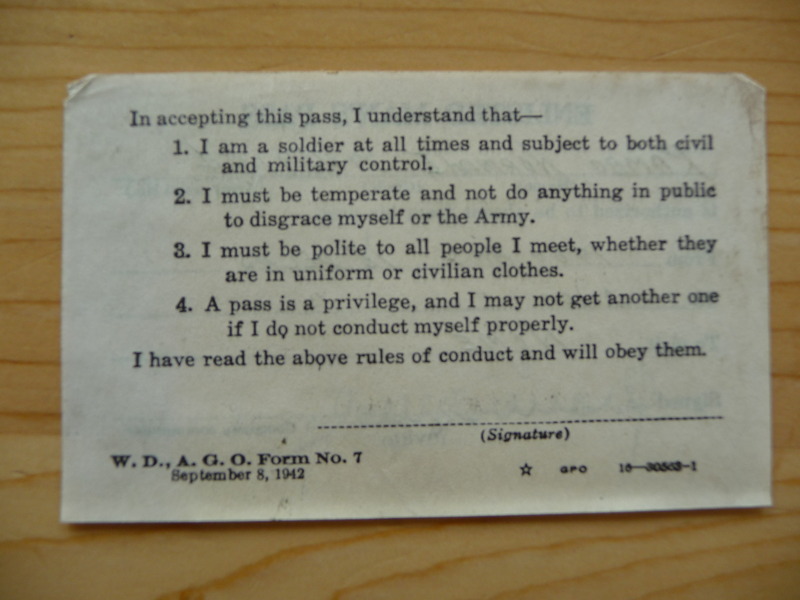 I’d like to think that in accordance with pass rule number 2 (see above) that he did not do anything in public to disgrace himself or the Army. When I eventually do get that iPad, there won’t be anything that interesting falling out from between its pages. Amazingly enough, this book is still in print, click here to buy it on Amazon. It’s a damn good read. Both thumbs way up. Amazing! I wonder what a search of old records would reveal about Mr. Norman Rambo. Would be fun to discover. Dana, there’s your hook for another Kate or Liam adventure! Nope, you won’t find anything like that in a Kindle or iPod. I did a quick Google, and there are several finds! Oh, I do hope you can find him and learn his story. Mysteries are my addiction and I’ve had lots of fun with Norman Rambo today. And while you can’t find something like this in a digital book, you can find all kinds of interesting genealogical and historical information on the web. 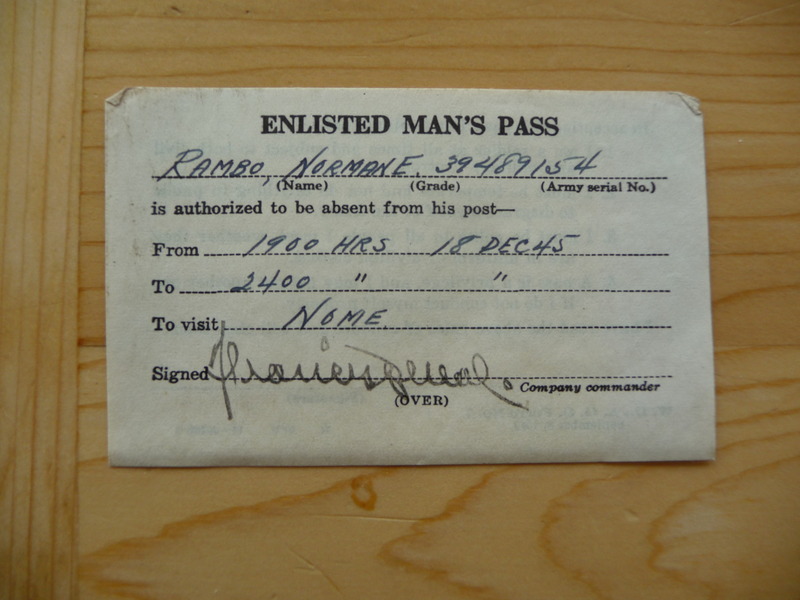 Norman E. Rambo was born in 24 March 1915 in Iowa, enlisted at Ft. Lewis, Washington, graduated from high school, was single and as a civilian worked as a clerk. He was a resident of King Co. Washington. In 1930, he lived with his parents, Haven H. and Pauline Rambo at 8119 Latona St., in Seattle. His father was a policeman and his mother a saleslady in a department store. His SSN death record shows he died 19 May 2001. He played football and graduated from Ballard High School. A family marriage record indicates he married Marjorie Lou Christie in Nome, Alaska on 30 June 1946. A divorce was asked for by Marjorie L. from Norman E. Rambo in 1965. In 1970 the Seattle Times says Norman had a wedding license to marry Rita M. McSharry. Newspapers from the 1950s thru the 1970s show that he sang tenor and was very active with the Seattle Chorale. Great detective work, Bobbi. I heart the Internet. Maybe he wanted leave to visit his girl? He got married in Nome 6 months later according to Bobbi’s research. Norman E. Rambo was my dad. How cool that you found something from his youth which I now found on the internet. He and my mother were married in Nome at the end of the War. How wonderful to hear from you, Doug! Yes, opening that book and finding your dad’s pass was like opening up a treasure chest. Or a time machine. Absolutely delightful. I’m sitting here grinning. Best of all, his son found you and left you a note. I’m the volunteer book lady at the American Cancer Society Discovery Shop in San Diego/Point Loma. There are always wonderful books coming in. I’ve bought two of your books there as well as a first edition Gift from the Sea. Thanks for this charming story. Fantastic find Dana. It is a little piece of history and to have his son connect too! I did wonder if he went to meet his future bride that night and loved how Doug gathered all the information too. Wonderful find, wonderful wondering and wonderful result. I am smiling here too. I adore previously used books for this reason. I often find myself wondering about people when I read inscriptions on the inside cover with the date and wonder what ever happened to them. Love it, thank you for sharing. Fascinating! Additionally, Ernie Pyle, an Indiana University graduate was just immortalized in bronze at IU. He is shown at his typewriter, writing the war news. Dana, a wonderful find. I have some wartime finds, now inspired to research ’em. Thanks! Love this story. You are right, you would never experience this on a kindle. But, we can enjoy good stories both ways. I am hoping the authors get money from the Kindle editions as well as from the regular books. From used books I ended up with a signed musher card of Libby Riddles and a letter from Mardie Murie to the original owner of the book! Great treasures as far as I’m concerned! Wow! It’s great that Norman’s son found out about the book. Genealogy lets us have our own family history mysteries. Maybe they aren’t written with as much panache as one of Dana’s, but they’re ours and let us have our own Ah Ha! moments. So glad Dana shared her used book mystery. I will get it. I got Harpo Speaks on your recommendation and I can barely put it down and will be sad when I am done. 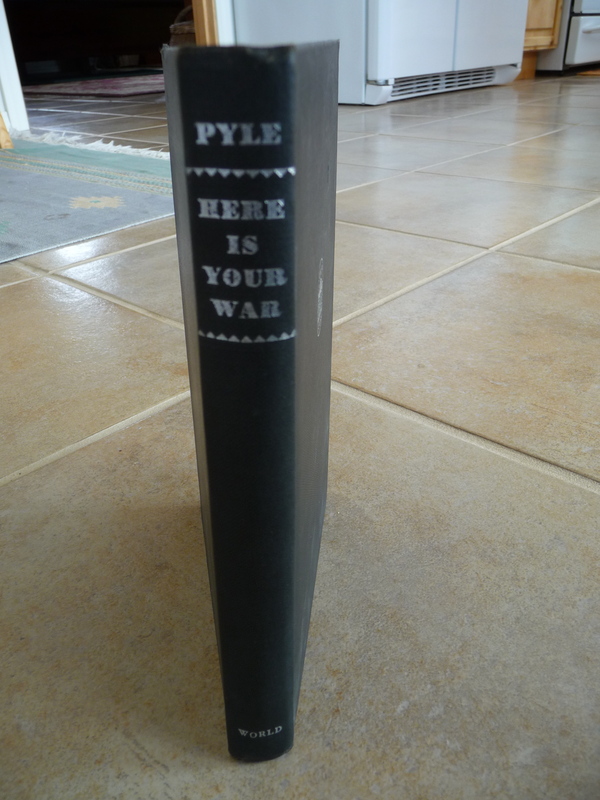 I got it from amazon and was so pleased to see it was a first edition printed in Great Britain in 1960. Had Essex, UK on the library sticker. Thanks for another great suggestion. I love used books too. A couple years ago, my sister in law accidentally left one of your Kate Sugak books at our house. I read it and was hooked. I went on the internet and ordered all of the rest of them for about $.75 each! This is great since I’m retired and living on a fixed and severely limited income. I couldn’t find or afford them all at bookstore prices. Great read. My wife and several of our friends have also read them all. We get impatient sometimes waiting for the next one. What a marvelous find! I love your books. 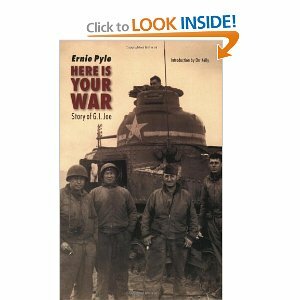 WhenI was a kid, I read everything about and by Ernie Pyle. I even saw the movie. Wonderful story Dana! Isn’t it amazing, and scary what can be found on the internet? But, it does help to insure that stories like Norman Rambo’s do not die with that person. I love used books, unfortunately reading puts me to sleep (great for insomnia). I prefer to read interesting tidbits on the internet, and to listen to audio books. I have listened to your books that are available on audio, and have loved them all! Sad that I will not ever have such an interesting piece of history fall out of an audiobook or my iPad. It is special to hold something from the past in your hand, and actually imagine…. Thanks for sharing! My older sis and I are in the process of cleaning out my parents’ house. We are finding family treasures (letters from family in books; water colors Grandma painted and signed in 1914-age 14, etc.!) and mysteries (who is that French pencil portrait of??) Makes for slow going, but so exciting, too! Thanks for sharing, Dana. this is a wonderful story with excellent comments. Thank you all. Years ago, at my library’s used book sale, I found a copy of “A Child’s History of the World,” by V. M. Hillyer, which I had loved as a child, copyright 1924. (I think the one I read as a child was a more recent edition.) Inside the front cover is stamped “Q. Roosevelt, Oyster Bay,” and “Quentin Roosevelt” is printed in pencil on the same page. One of Theodore Roosevelt’s sons was Quentin, but he was killed in WWI; my best guess is that this book belonged to his namesake, his brother Ted’s son (and therefore President Roosevelt’s grandson), born in 1919. Sagamore Hill, TR’s home in Oyster Bay, NY, is just a few miles from my home, so how the book ended up at my library is not very mysterious. I too love used books. Helene Hanff, author of 84 Charing Coss Road, wrote of her love for them too. The movie starred Anne Bancroft and Anthony Hopkins. Ms Hanff’s joy in reading where the book fell open too a much loved passage, the feel of the leather cover got to me. I began to collect copies of Mark Twain, leather bound with, when possible, hand tinted illustrations. A true joy to handle and read. I love Hanff’s book, too, Susan, for all those same reasons. Just wanted to say how fascinating this story was and thank you for the late-night read!